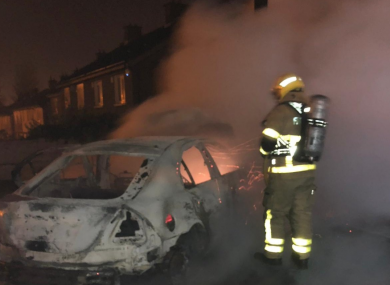 Firefighter in breathing apparatus extinguishing a car fire in South Dublin on Halloween. 100: The number of panes of glass that were smashed in an Offaly church overnight this week. 64.85: The percentage that the referendum to remove the offence of blasphemy from the Constitution passed by. 900: The number of calls that Dublin Fire Brigade received on Halloween. 120,000: The number of apples a Tipperary farmer gave away to local schools in a bid to promote healthy eating. 67: The percentage of people who think Ireland should stop turning back the clocks twice a year and keep the same time zone all year round. €1.5 million: The total amount of money raised from the Liam Miller tribute match. 5: The number of complaints upheld by the Advertising Standards Authority of Ireland against Eir over a range of ads that were found to be misleading to customers. 6: The number of months that Sinn Féin’s Peadar Tóibín is suspended from the party for after he voted against abortion legislation in the Dáil last month. 9,055: The number of admitted patients that were forced to wait on trolleys and chairs in hospitals last month. 182 metres: The height of the world’s tallest statue that was unveiled amid protests in India this week. 20,000: The number of people who took part in the 39th annual Dublin Marathon. Email “How many calls did Dublin Fire Brigade receive on Halloween? It's the week in numbers”. Feedback on “How many calls did Dublin Fire Brigade receive on Halloween? It's the week in numbers”.